S.M. Entertainment successfully wrapped up its flagship concerts in Santiago. 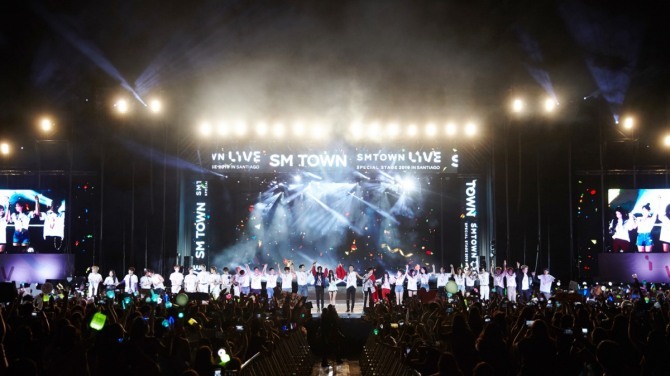 According to the K-pop agency Monday, its concert series, titled “SMTown Special Stage in Santiago,” took place Jan. 18-19 at the Chilean city’s sports complex Estadio Nacional, the biggest concert stage in the country and the first venue in South America to host the agency’s signature event. The show, which ran about four hours, featured a total of 45 songs by S.M. musicians such as BoA, Super Junior, EXO, Red Velvet, NCT 127, Yuri and Hyoyeon of Girls’ Generation, Amber of f(x), and Taemin and Key of SHINee. BoA performed her latest hit, “Woman,” while Super Junior, EXO, Red Velvet and NCT 127 respectively showcased “One More Time,” “Love Shot,” “RBB” and “Regular.” The event also saw solo performances by musicians like Yesung of Super Junior, Yuri, Key, Taemin and Amber, who performed “Fly,” “Into You,” “One of Those Nights,” “Move” and “Countdown,” respectively. Super Junior, riding high on the Latin pop wave, mesmerized local fans by covering the Luis Miguel hit “Ahora Tu Puedes Marchar” in Spanish. “SMTown Special Stage in Santiago” is part of the “SMTown Live” global concert series, which kicked off in 2008 and has brought the agency’s top musicians to cities like Seoul, New York, Paris, Tokyo, Osaka, Beijing, Shanghai, Bangkok, Singapore and Dubai.